One lucky winner this week will receive a 15.00 gift card to The Whimsy Store...How AWESOME is that, so come on over and join the fun at OUR BLOG!!! 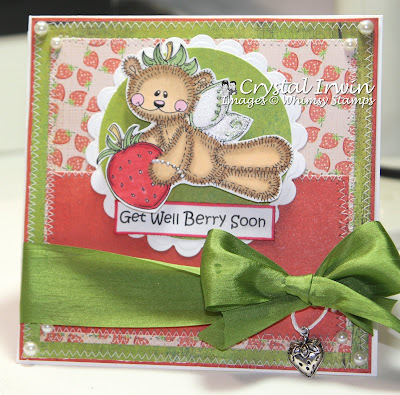 For my creation today I used this darling image Strawberry Fairy in the Meljen's Digital Collection. When I think of strawberries I think summer!!! I thought this image was perfect for the challenge. I used the fun Basic Grey Paper Nook & Pantry. This card I created today is for a wonderful Blogging Sister Michelle Oatman AKA Donkey Smiles. She was seriously injured in an accident on her farm. This accident resulted in the loss of her right eye. Michelle has a very long road of recovery ahead of her as well as learning to live her life with only one eye. She will have surgeries and continued care and therapy as she continues to heal. ASFOS blog is hosting a card drive for Michelle with some wonderful sponsors. Please if you get a chance make Michelle a card. Whimsy stamps is offering a FREE DIGITAL (created by Melissa) you can grab this SWEET image HERE. She REALLY loves Donkies and this image is PERFECT for her...We would love to flood Michelle's mailbox with well wishes from around the world. So if you have time, please help this special cause! I can only imagine her grief at this time. Please visit HERE for more information on this special card drive. Here is my creation I made today for Going Grey challenge and for Michelle. Hope you enjoy!!! I hope everyone has a wonderful Tuesday!! What an absolutely stunning card,I just love everything about it,the image/colouring is prefect and the choice of papers is just gorgeous ,brilliant!!!! awww, so adorable Crystal! Happy image & colors, sure to bring a smile!!! This is absolutely adorable Crystal!! I LOVE that sweet image! Fantastic colors and layout! LOVE this girlie! That image is TOTALLY adorable and I LOVE your coloring!! What a beautiful card Crystal!! Love Strawberry Fairy. Your color and design is so summery and gorgeous!! Well written post. Michelle will love this girl!! Perfect paper for this image...super sweet! oh how fabulous! super colors, stunning bow and that charm is Perfecto!!! This card is so cute Crystal! I love the image that you used. What pretty colors to compliment it. Another great creation for the challenge! Thanks for letting us play with the images! What a gorgeous card for a great cause! That image is just so cute, and I love the dp and colors you used! This is an adorable image and perfect for the paper you chose. Great job! Your card is so cute! What a great cause, Crystal! Thanks for sharing this info with us. I will definitely send Michelle a card! Beautiful card Crystal and I just love the sentiment! What an adorable card, Crystal, I'm sure Michelle will love it. So cute! WoWzA, this is gorgeous, Crystal! Love the image ... it's so beautifully colored ... and the great color combination ... love it! Awww, you always make the cutest cards, Crystal...I just love that sweet image and what pretty papers and sewing!!!! Mmmmmm my favorite .. strawberries! This is adorable and there you go with that stitching again ... AMAZING!! Awesome job my friend!! Hope to see you soon! Oh this is so cute Crystal!!! I love the dp and it's perfect with your adorable image! Fabulous my friend! oh very gorgeous card and fab image !!! thanks for your participation to A.S.F.A.S !!!! i love colors and i love stamp !! What a sweet card! I am sure Michelle will love it. Great bow & charm! great card and I will have to check out the card drive. Oh I really love this Crystal! It has such sweetness to it...and I so love the red/green combo!